This October ground-breaking choreographer Shobana Jeyasingh brings Bayadère – The Ninth Life to the Sadler’s Wells stage. This work is a departure from Jeyasingh’s usual works as it is a full-length piece that has a strong narrative. Moving between fact and fantasy, the choreography interweaves the original story of Marius Petipa’s La Bayadère ballet with the first-ever visit of Indian temple dancers to Europe in 1838. But what is the original ballet about? Where and when was it created? And how did it become one of the most well-known ballets still performed throughout the world? 1. The word bayadère is French for Indian temple dancer, originating from the Portuguese word ‘ballar’, meaning dance. 2. 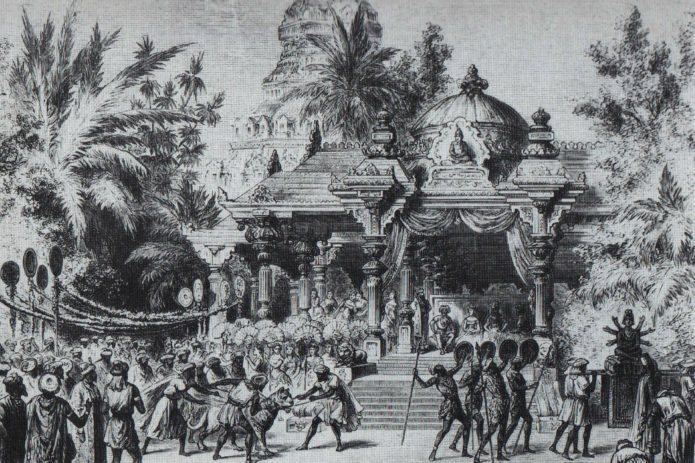 The first visit of temple dancers to Europe was in 1838. They were brought over to France by an enterprising impresario – EC Tardival (pictured left) – from Pondicherry in south India. They stayed for over a year and performed in Paris, Vienna, Antwerp, Brussels, London and Brighton. 4. La Bayadère was first staged in 1877 by French choreographer Marius Petipa to the music of Ludwig Minkus at the Bolshoi Theatre in St Petersburg. 5. The ballet was created especially for the benefit performance of Ekaterina Vazem, Prima Ballerina of the St. Petersburg Imperial Theatre. 6. Petipa spent almost six months staging La Bayadère. During rehearsals, he clashed with Prima Ballerina Vazem over the matter of her entrance in the ballet’s final Grand pas d’action, while also experiencing many problems with the set designers who constructed the ballet’s elaborate stage effects. The temple dancer, Nikiya, has secretly sworn her eternal love to the warrior Solor. When she rejects the High Brahmin, he takes revenge on Solor. But his actions have terrible consequences. The High Brahmin reveals the secret affair to Solor’s fiancé – the Rajah’s daughter. To his horror, she arranges Nikiya’s murder. Solor dreams of reuniting with Nikiya in the famous Kingdom of the Shades scene – then awakens, remembering that he’s still engaged. At his wedding, however, he sees a vision of Nikiya. He mistakenly says his vows to her, instead of his bride-to-be and the gods become infuriated and destroy the palace. Solor and Nikiya reunite in spirit, in the Kingdom of the Shades. 8. The ballet wasn’t seen in the West until 1961 in Paris. Two years later, Rudolf Nureyev staged The Kingdom of the Shades for the Royal Ballet with Margot Fonteyn as Nikiya (pictured left). 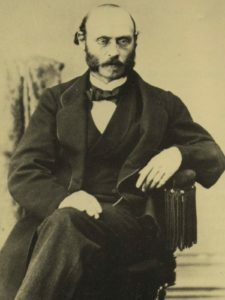 Minkus’s music was re-orchestrated by the Royal Opera House’s composer/conductor John Lanchbery. The premiere was a resounding success, and is considered to be among the most important moments in the history of ballet. 9. The Kingdom of the Shades is one of the most celebrated excerpts in all of classical ballet. Traditionally, the dance begins with 32 women in white, all making their way down a ramp in unison. The dance is exquisite, and often performed by itself. 10. Nearly all modern versions of La Bayadère are derived from the Mariinsky Ballet’s production, which was originally staged in 1941 by Vakhtang Chabukiani and Vladimir Ponomarev. Natalia Makarova’s 1980 production for American Ballet Theatre has also been staged by several theatres throughout the world and is itself derived from Chabukiani and Ponomarev’s version. 11. American ice skater Gracie Gold will be performing a version of La Bayadère in the 2018 Winter Olympics. 12. La Bayadère was the last production Rudolf Nureyev worked on, performed at the Palais Garnier, Paris in 1992. Shobana first saw Natalia Makarova’s production and whilst admiring the staging and the choreography, was shocked by its clichéd vision of the Orient and the Indian temple dancer. In Bayadère – The Ninth Life she challenges the West’s fascination with the myth of the Orient and examine how this legacy has directly affected the Indian diaspora today. Shobana Jeyasingh Dance will be performing Bayadère – The Ninth Life at Sadler’s Wells 16 and 17 October. Book here.